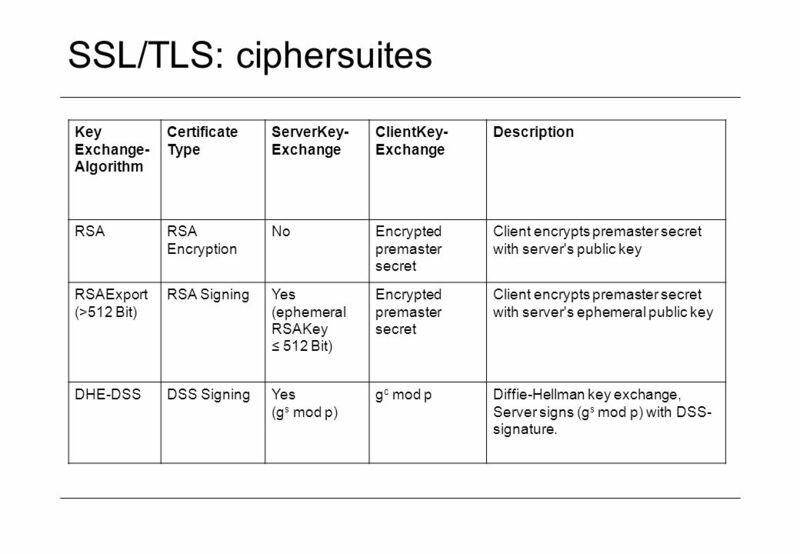 7 SSL/TLS: ciphersuites Key Exchange- Algorithm Certificate Type ServerKey- Exchange ClientKey- Exchange Description RSARSA Encryption NoEncrypted premaster secret Client encrypts premaster secret with server's public key RSAExport (>512 Bit) RSA SigningYes (ephemeral RSAKey 512 Bit) Encrypted premaster secret Client encrypts premaster secret with server's ephemeral public key DHE-DSSDSS SigningYes (g s mod p) g c mod pDiffie-Hellman key exchange, Server signs (g s mod p) with DSS- signature. 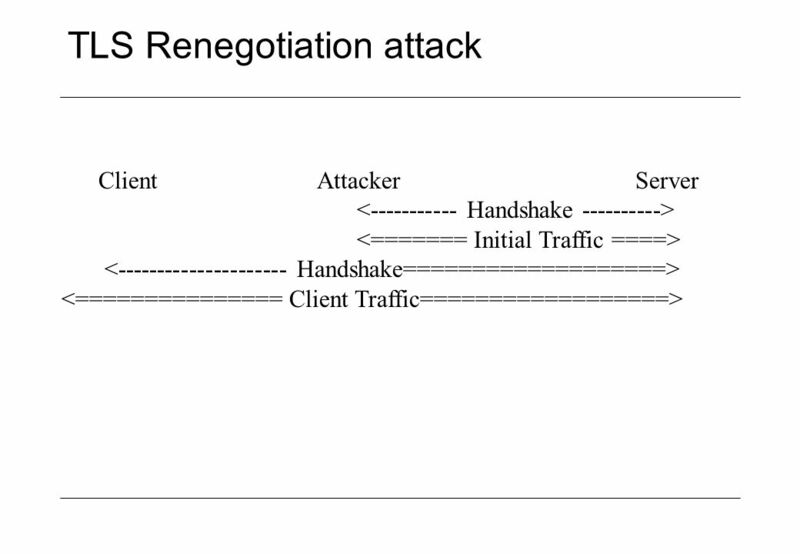 11 TLS Renegotiation attack Client Attacker Server There is much work currently done at the IETF on how to fix the protocol. This is a great example for the importance of modeling and proof in practical crypto. 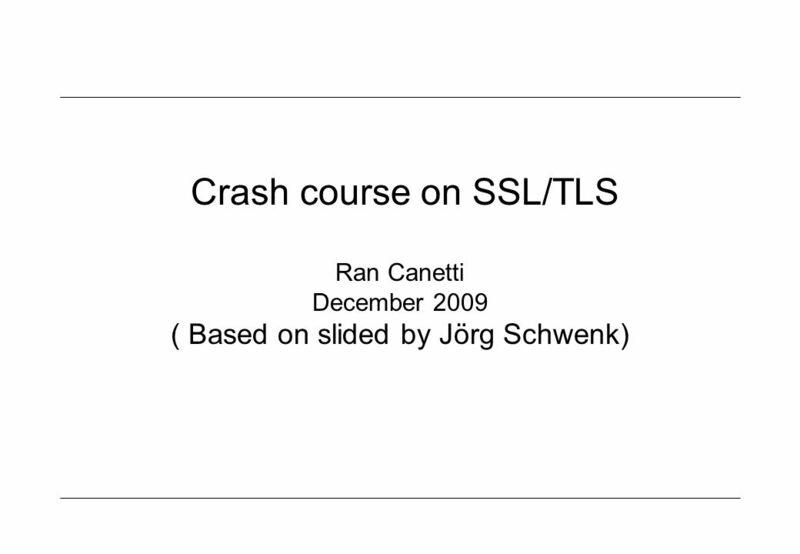 Download ppt "Crash course on SSL/TLS Ran Canetti December 2009 ( Based on slided by Jörg Schwenk)"
SSL/TLS Protocol Network Security Gene Itkis. Basic paradigmatic application: on-line purchase Client contacts Server (possibly for the first time) Spontaneity. Computer Science CSC 474Dr. Peng Ning1 CSC 474 Information Systems Security Topic 4.5 Transport Layer Security. 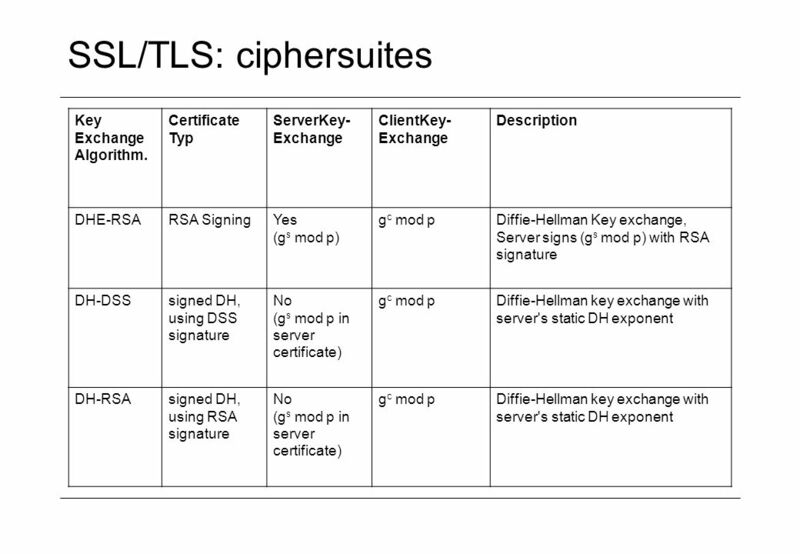 1 Lecture 17: SSL/TLS history, architecture basic handshake session initiation/resumption key computation negotiating cipher suites application: SET. CS470, A.SelcukSSL/TLS & SET1 CS 470 Introduction to Applied Cryptography Instructor: Ali Aydin Selcuk. SSL Protocol By Oana Dini. 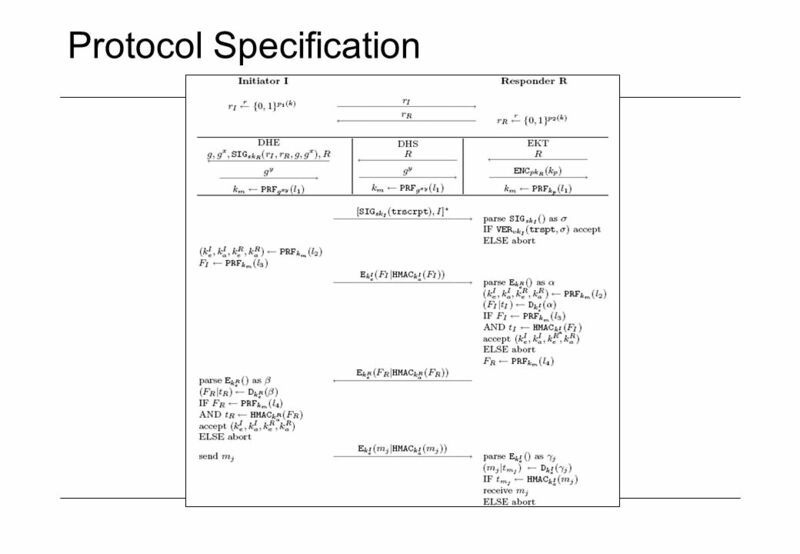 Overview Introduction to SSL SSL Architecture SSL Limitations. 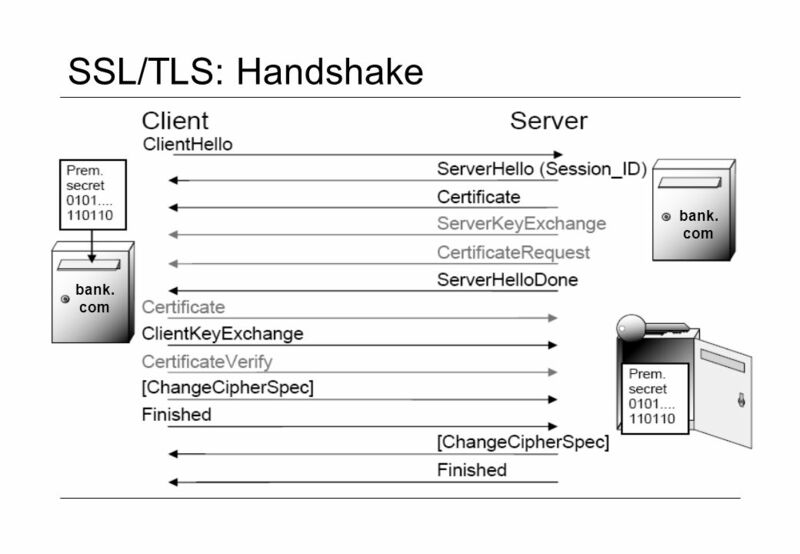 TLS Introduction 14.2 TLS Record Protocol 14.3 TLS Handshake Protocol 14.4 Summary. SMUCSE 5349/49 SSL/TLS. SMUCSE 5349/7349 Layers of Security. 17.1 Copyright © The McGraw-Hill Companies, Inc. Permission required for reproduction or display. 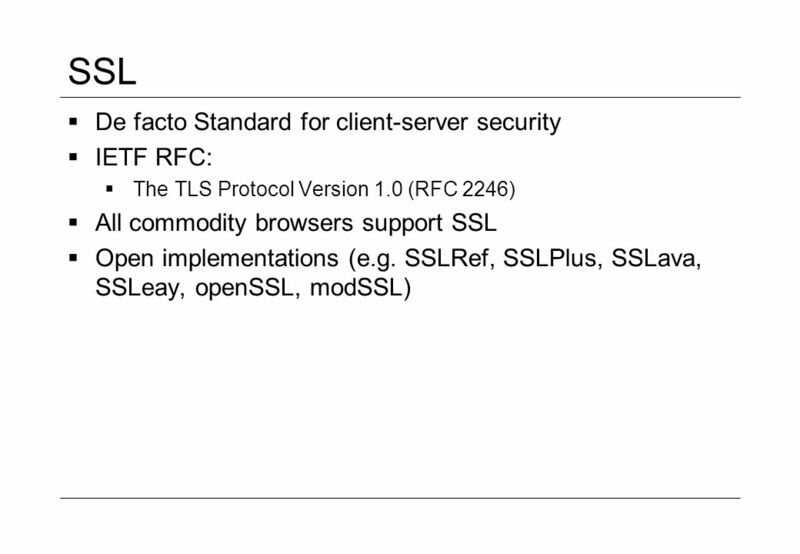 Chapter 17 Security at the Transport Layer: SSL and TLS. Transport Layer Security (TLS) Bill Burr November 2, 2001. 1 SSL/TLS 2 Web security Security requirements Secrecy to prevent eavesdroppers to learn sensitive information Entity authentication Message authentication.